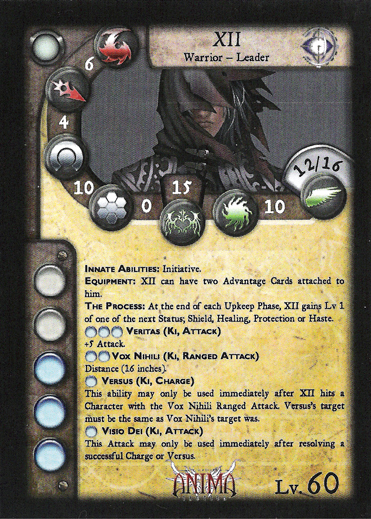 Equipment: XII may have two Advantage Cards attached to him. The Process: At the end of each Upkeep Phase, XII gains Lv1 of one of the next Status: Shield, Healing, Protection or Haste. This ability may only be used immediately after XII hits a Character with the Vox Nihili Ranged Attack. Versus's target must be the same as Vox Nihili's target was. This Attack may only be used immediately after resolving a successful Charge or Versus. A part of Team Assault Group along with Rayne and Lorenzo. Little is known about XII, the reserved and solitary supervisor of the Crows of Wissenschaft. The majority of agents of the organization have never seen him, much less know him. He is a shadow that crawls in the dark, someone who appears inexplicably in different places of the world and leaves without a trace. Many say that he is no more than a ghost, a legend whose mantle is taken up by a different person over and over again. However… he is very real.